WebnComp publishes helpful, useful articles, tutorials, how-to guides relating to world wide web, internet and computer science. 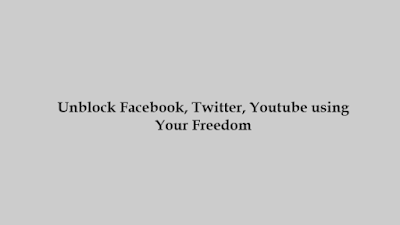 In this article we will look at how we can unblock Facebook, Twitter, Youtube and other blocked websites using Your Freedom software. First we will download Your Freedom software, then we will register a free Your Freedom account at Your Freedom website. Lastly, we will install and configure Your Freedom client software on our PC. Your Freedom is a free but very sophisticated internet tunneling software. 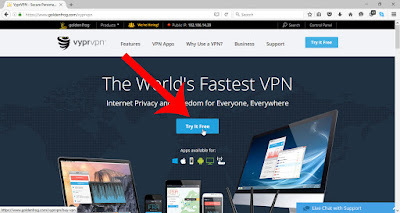 It is not a VPN software but can do much more than a typical VPN software. First launched in 2004, Your Freedom offers both free and paid accounts. Free account comes with some restrictions but these restrictions can easily be waived off by buying a paid package plan. Maximum connection time is 1 hour. After one hour, you will be automatically disconnected. But you can connect again immediately. The free account doesn't behaves the same in all countries. For some countries, certain restrictions are not applicable while others do change. The maximum connection time can be made unlimited while bandwidth limit can go up to 512 kbits/s. 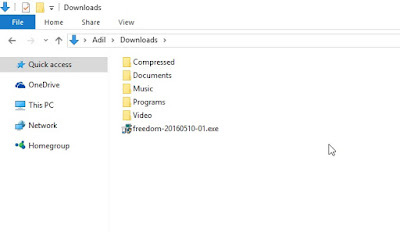 Your Freedom client software is available for these operating systems. As of writing this, Your Freedom offers the following package plans. Click here to get an up to date list. 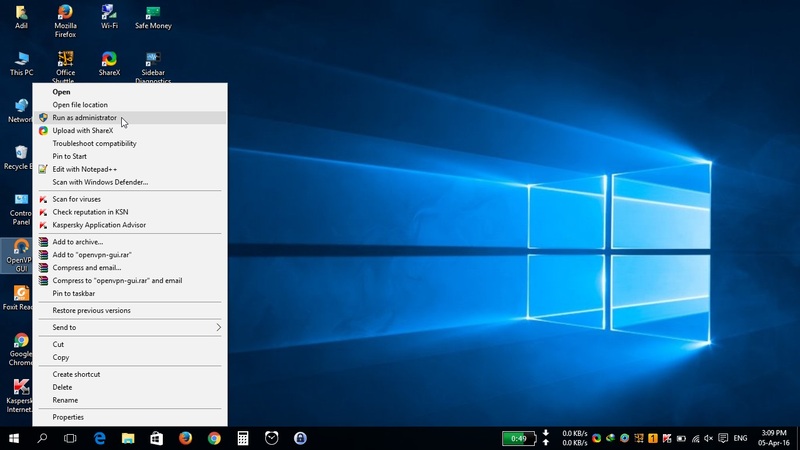 This step-by-step guide is written for Windows 10. The process is similar for other versions of Windows. 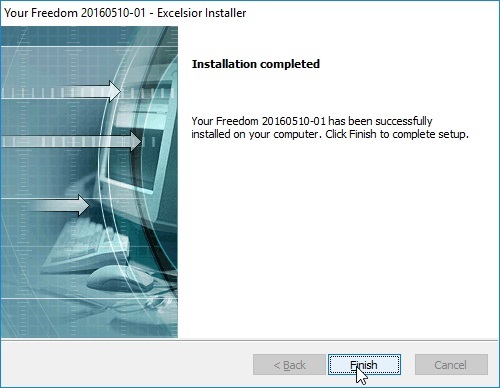 Go to Your Freedom website to download the latest version of Your Freedom client software. 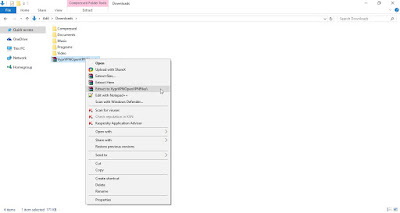 Click the download link for Windows full installer as seen in figure 2. 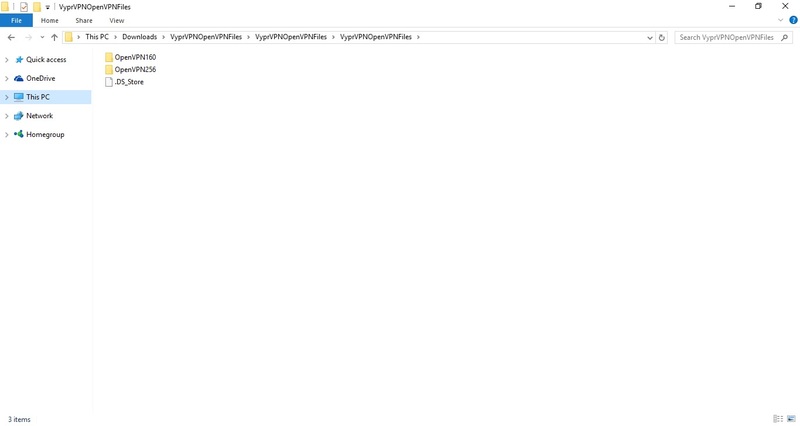 Click the create an account hyperlink on the same web page. 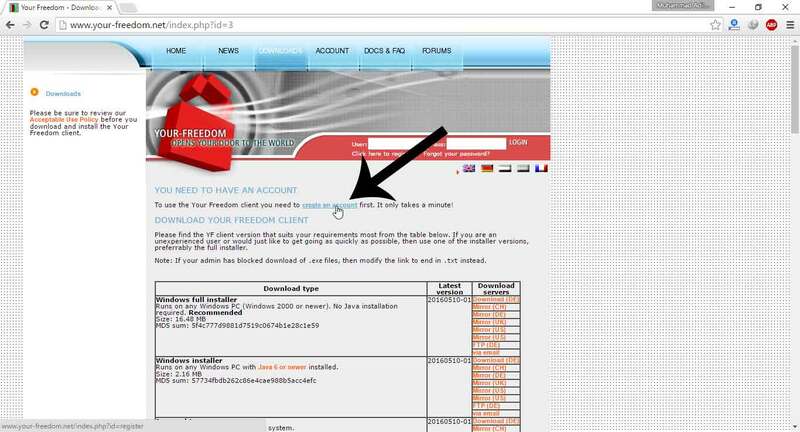 Before we can use Your Freedom to unblock blocked websites, we need to create an account. 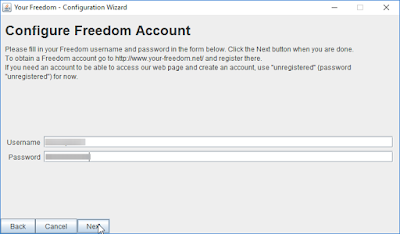 Your Freedom allows you to create a free account called FreeFreedom account. 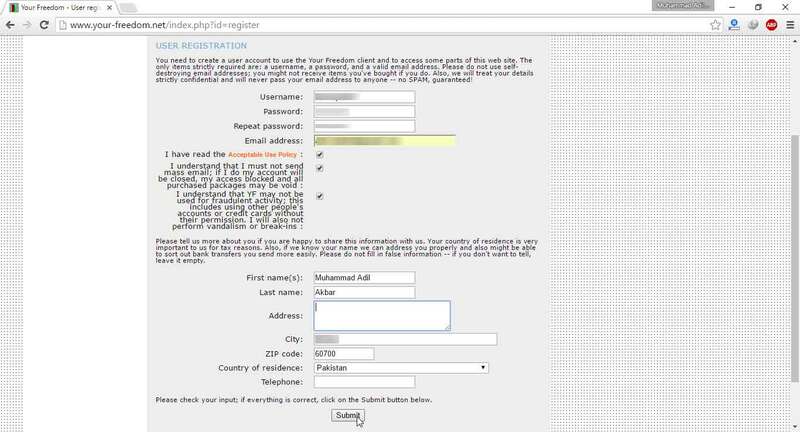 On the User Registration page, the only items strictly required are username, password and a valid email address. Fill in the required fields and click the Submit button. 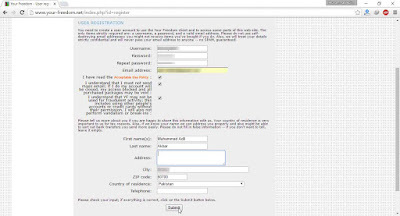 After clicking the Submit button, you will need to verify your e-mail address. 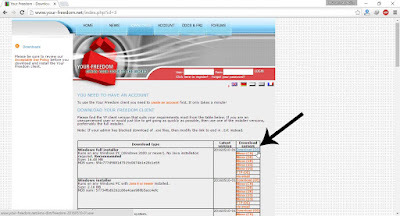 There will be an activation link in an e-mail sent by Your Freedom to your e-mail address. Click the link and a web page will appear saying that your account has been enabled. 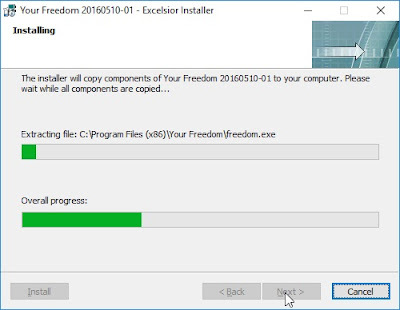 Now we need to install Your Freedom client software on our PC. Locate the Your Freedom client software setup file which we downloaded in step 1. It will be in the Downloads folder on your PC. Launch the setup. 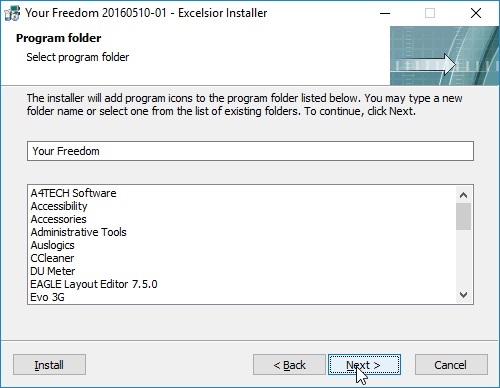 Notice the file name of the Your Freedom client software setup file. It follows the format freedom-YYYYMMDD-Serial where YYYY = year, MM = month, DD = date, and Serial = serial number of the setup released in the day. 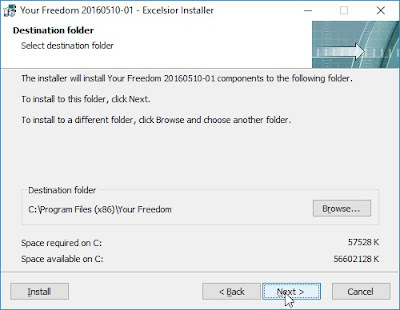 In the figure 6, you can see the file name is freedom-20160510-01 which shows that this is the first version released on May 10, 2016. Select Yes when the Windows asks you about allowing Your Freedom to make changes to your PC. Your Freedom installer will open. Click Next button. 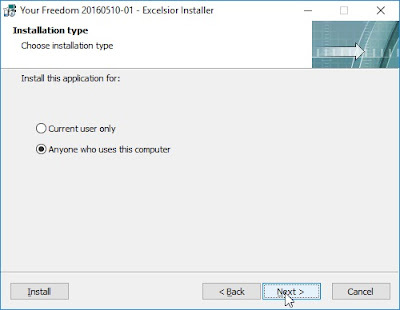 Choose if you want to install this software for current user only or for all users on this computer. 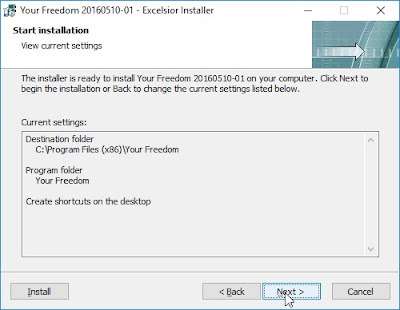 The installer now asks you if you want to place a Your Freedom shortcut icon on your desktop. Click Next. 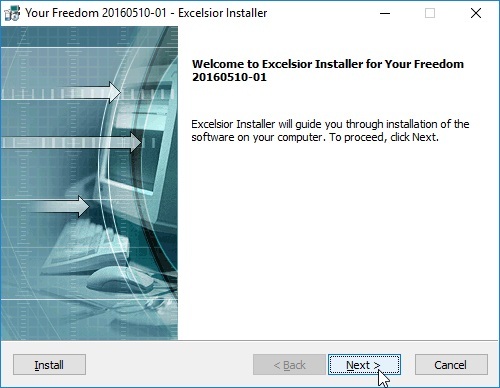 Your Freedom installer will now begin installing Your Freedom client software on your computer. This may take a few seconds to complete. Your Freedom client software is successfully installed. Click Finish. If Your Freedom does not starts automatically, launch Your Freedom by double clicking on its icon present on the desktop. 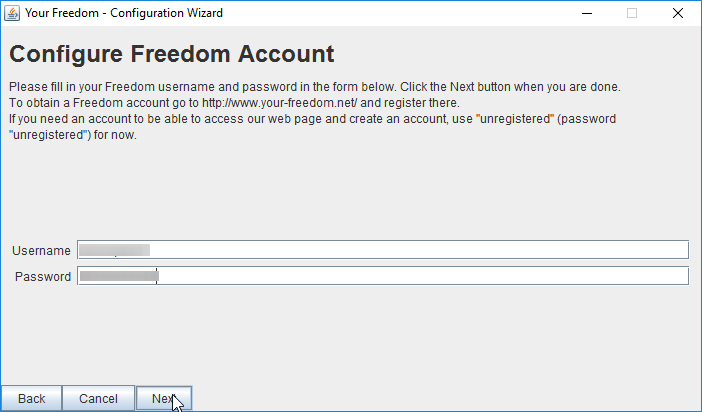 Upon first launch, Your Freedom client software will start a configuration wizard. Select your language. 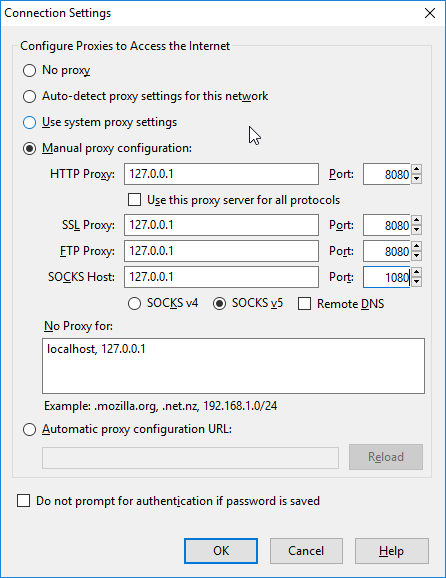 If your network administrator has given you a proxy and port to access internet, enter this proxy and port. 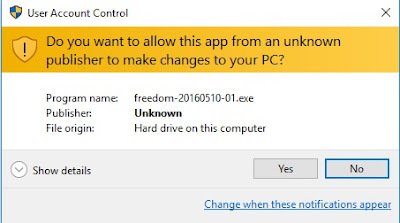 Your Freedom will auto detect proxy and port, if it is already set in your computer. You can apply special connection tweaks on this screen. Open the drop down menu to see if your ISP is there. If it is, select it. 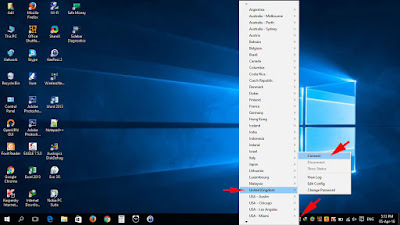 Special connection tweaks can even help you to access free internet on your cellular internet connection. Your Freedom uses different protocols / connection methods to connect to its servers. 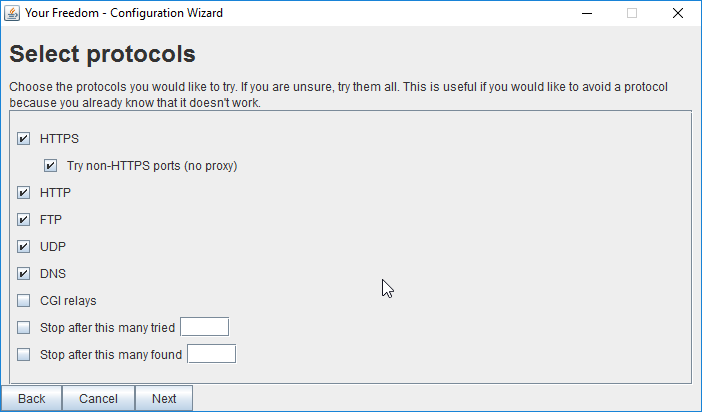 On this screen, you can select which protocols Your Freedom connection wizard should try to see if it can reach the servers using these protocols. 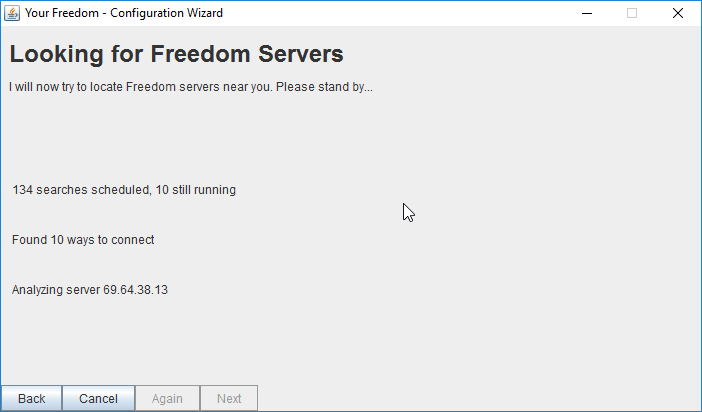 Your Freedom is looking for its servers. This may take a few minutes. 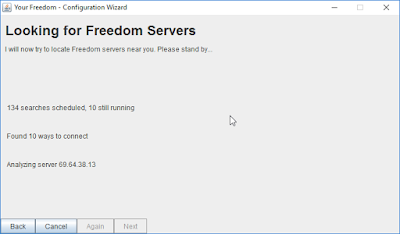 Your Freedom has found its servers. The column with header text Pref is preference. The highest preferred server for your connection is placed on top and is given 10.0 value. I selected a server in UK. You can select any server and click Next. 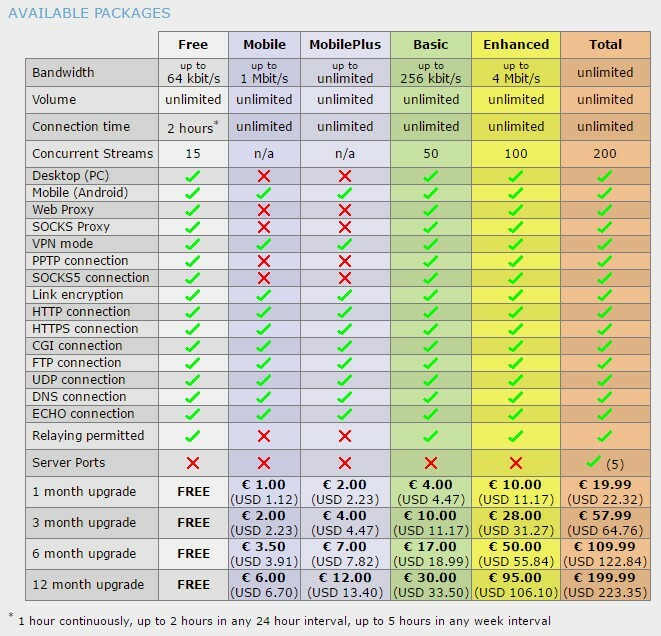 Figure 20: Your Freedom shows available servers. 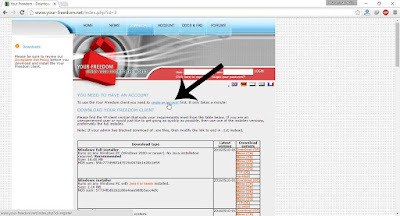 Enter the username and password of the account that we registered on Your Freedom website in step 2. Click Next. Everything is set up now. Click Save and Exit. Your Freedom main window with status panel selected will open (Figure 23). 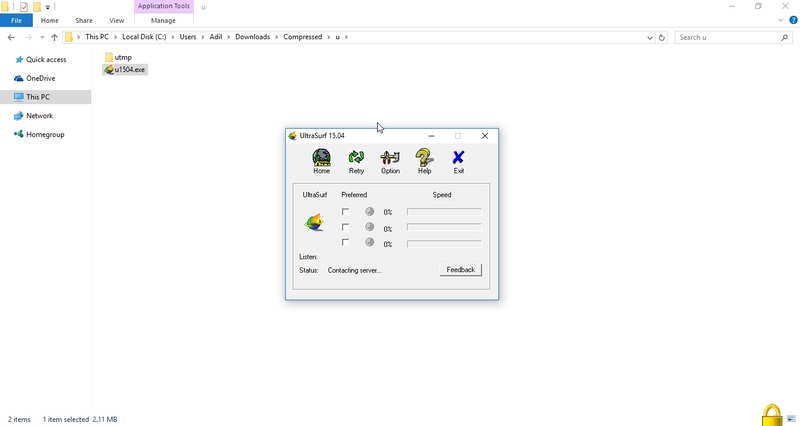 Click Start Connection button. 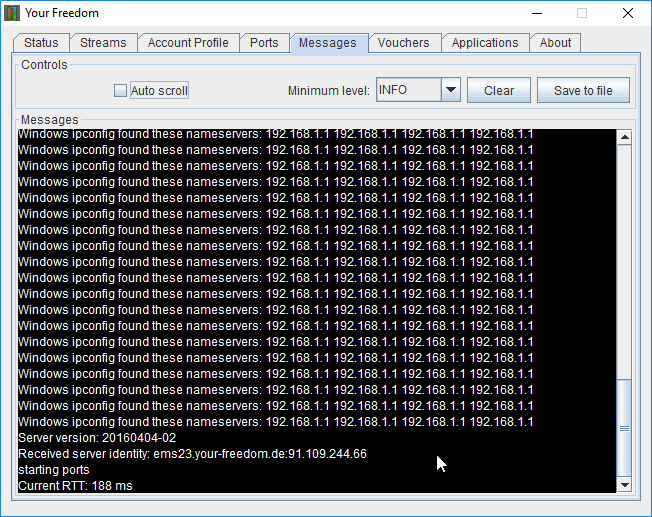 With Your Freedom connected to its server, the status panel window will look like as shown in the figure 24. Notice the door which was previously closed is now partially open. This indicates that Your Freedom is successfully connected to its server. When you would like to disconnect, click the Stop connection button. Check out the messages panel window. 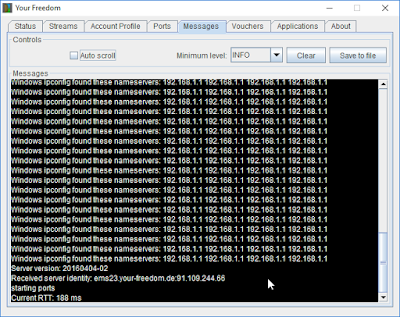 It shows messages related to your connectivity to Your Freedom servers. Your Freedom displays starting ports message when its ready to unblock websites for you. How do you make any application to use Your Freedom to access internet? 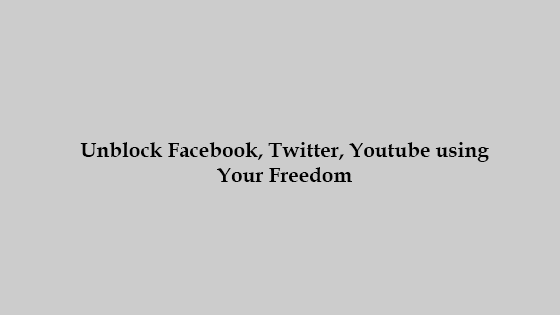 In our case, we want to unblock blocked websites like Facebook, Twitter, Youtube using Your Freedom. So we need to make web browsers use Your Freedom to access internet. Your Freedom provides local SOCKS4/5 and web proxy (see Figure 22) that we need to set in web browsers. 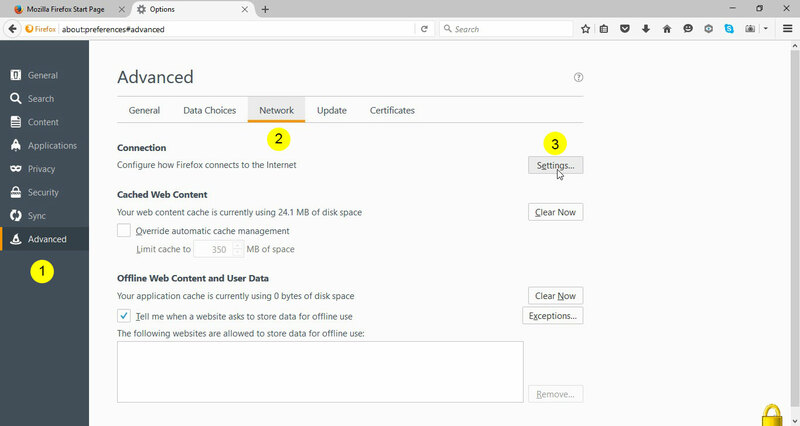 After you set the local proxy in Mozilla Firefox as seen above, you can browse the web and all the data will through Your Freedom servers. In this article we downloaded Your Freedom client software from Your Freedom website, registered a FreeFreedom account, installed Your Freedom on our computer, configured Your Freedom and finally connected to Your Freedom server. 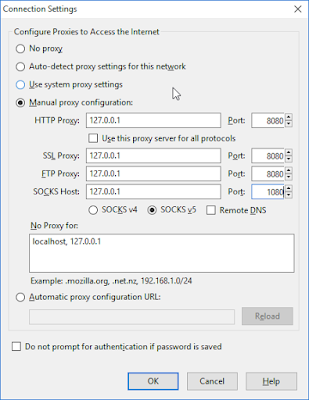 To be able to use our applications such as Mozilla Firefox and Google Chrome with Your Freedom, we need to set local SOCKS4/5 and web proxy provided by Your Freedom in our applications. 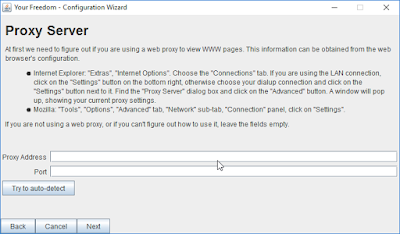 Desktop applications like web browsers easily provide you options for setting proxy while other applications like games may not provide option to set proxy. In this case we can use socksifiers or OpenVPN with Your Freedom. Liked this post? You can also like our Facebook page or follow us on Google+ to get notified of new tutorials as soon as they are posted. Lately, I've been writing posts about unblocking blocked websites. There are many ways to access blocked content on internet. I was forced to discover these ways when government of Pakistan blocked youtube in 2012. Though youtube is now unblocked in Pakistan, I thought of sharing all these ways that I know for the greater good of all. One way to access blocked websites is by using a software called Ultrasurf. 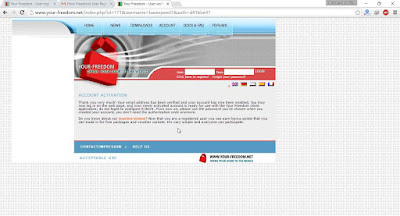 In this article I will show how you can unblock facebook, twitter, youtube using Ultrasurf software. Ultrasurf is a small software that can be used to unblock websites such as facebook, twitter, and youtube etc. 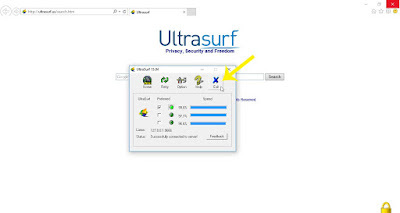 Ultrasurf is a software developed by UltraReach Internet Corporation, USA. The software was originally developed for helping users in China break government imposed censorship and access internet freely. Ultrasurf has now users from over 180 countries and can be used by anyone in the world. No installation needed, just download and run! The sad thing is Ultrasurf is only available for Windows operating system. 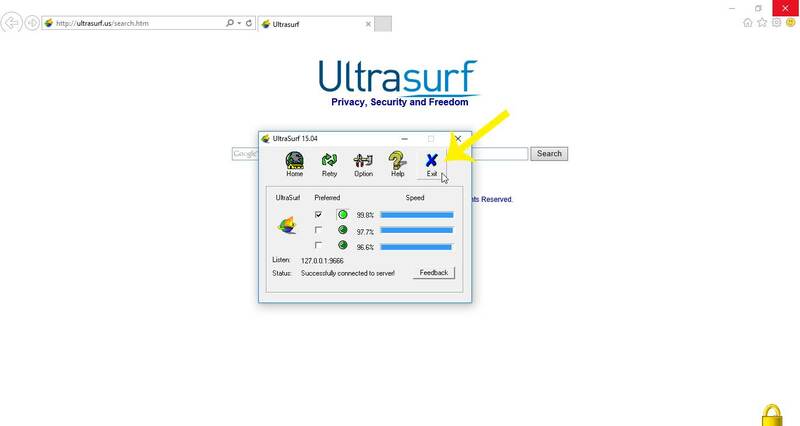 Go to Ultrasurf website and download the latest version of Ultrasurf software. A zip file will be downloaded. Locate the downloaded zip file. Windows 10 puts all files downloaded from internet in Downloads folder. 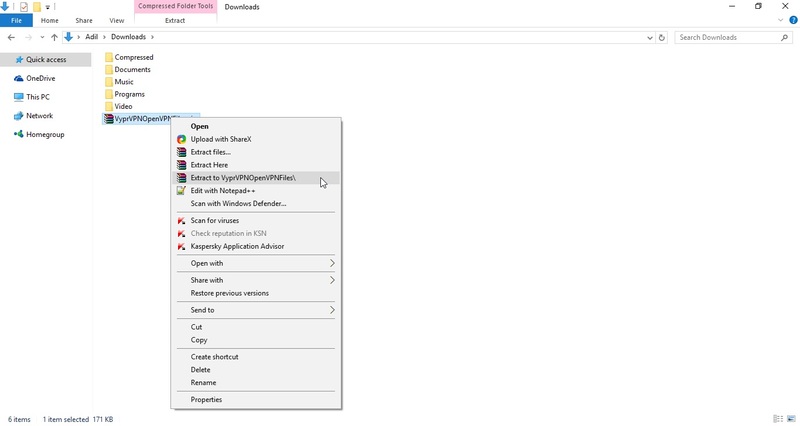 Right click on the downloaded zip file and select Extract to option. 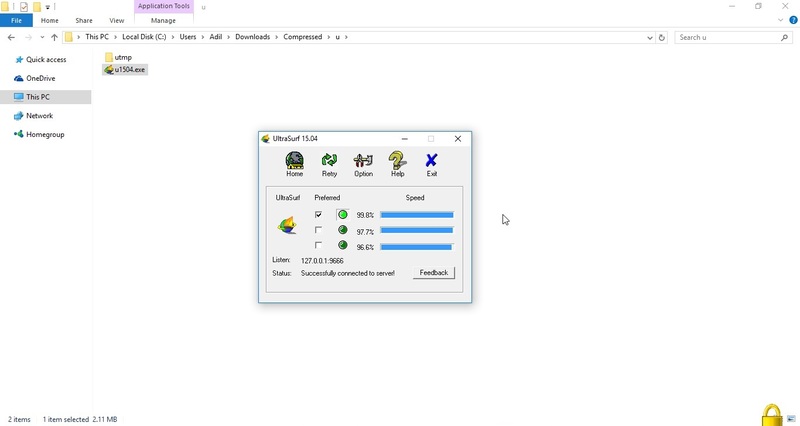 If you don't find this option, this means you do not have Winrar installed in your PC. 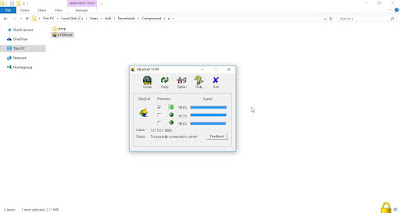 Winrar is a software that allows you to compress files and make archives. 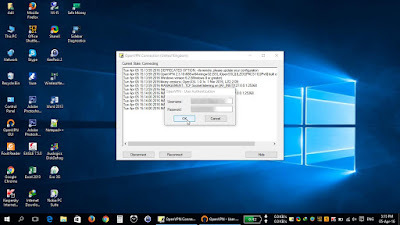 Windows also has builtin functionality that allows you to extract zip files. After extracting the zip file, there will be a new folder with the name "u" in the same location as of downloaded zip file. Open that folder and you will find an exe file. Double click on the exe file which will have a name starting with the letter u followed by four digits. The four digits indicate the version number. As of May 01, 2016 the latest version of Ultrasurf is 15.04. Thus in the figure 3, we can see the four digit number is 1504. Double clicking the exe file will launch Ultrasurf and Ultrasurf window will be like in figure 4. Wait a few moments while Ultrasurf connects to its server. After connecting with its server, Ultrasurf will automatically open Internet Explorer (Figure 5). 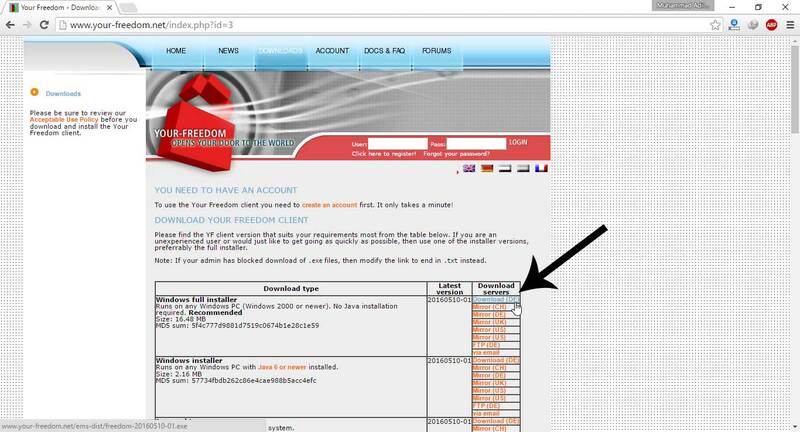 There you can type address of any blocked website like facebook, twitter, youtube and Ultrasurf will open it for you. Ultrasurf displays the message: "Successfully connected to server" (see Figure 6) when connected with its server. 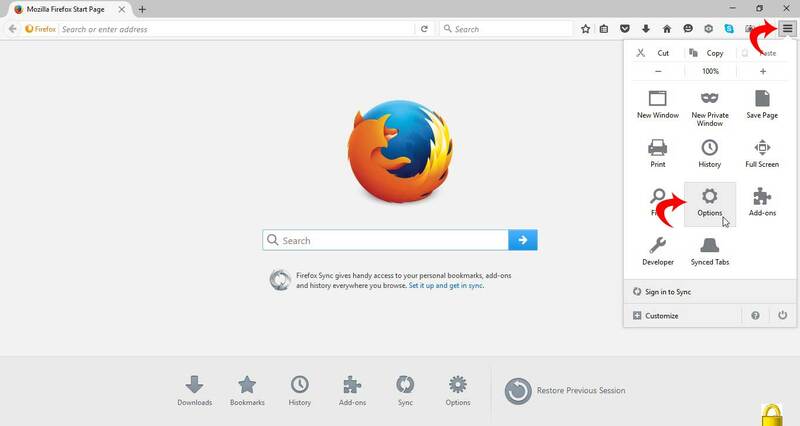 If you use Firefox web browser then you would need to manually put local proxy in Firefox to use Ultrasurf with Firefox. It's not that difficult. Just follow these steps. 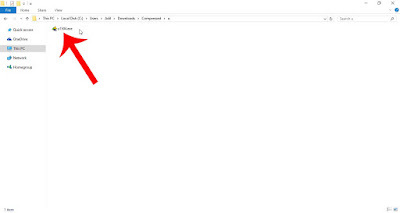 Launch Firefox and click the menu button in the top right corner. 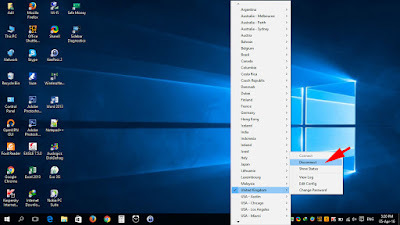 Choose Options from the submenu. Click the Advanced button. 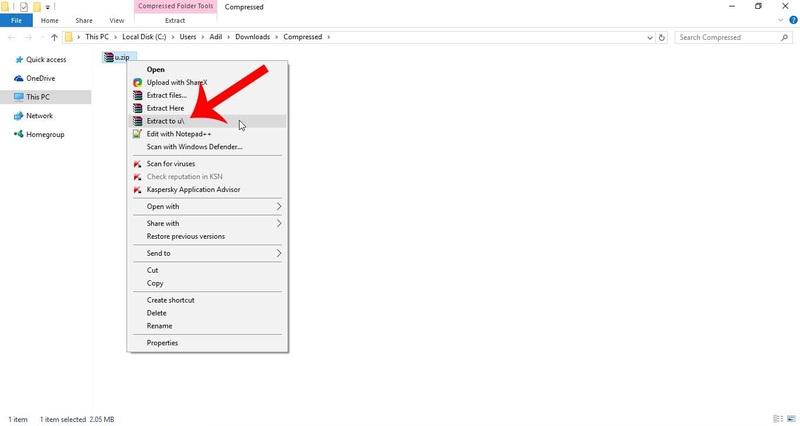 In the advanced panel, select Network tab. 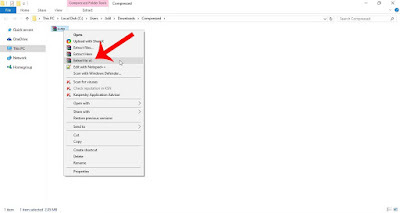 Lastly, in Connection section click Settings button (see Figure 8). 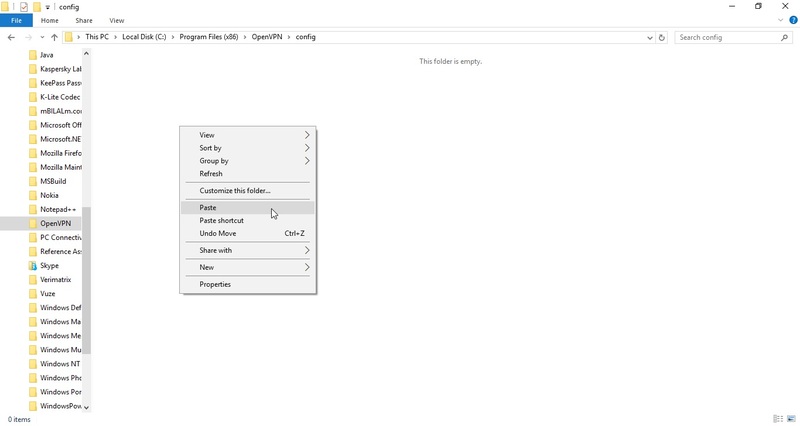 A small window with title Connection Settings will open. 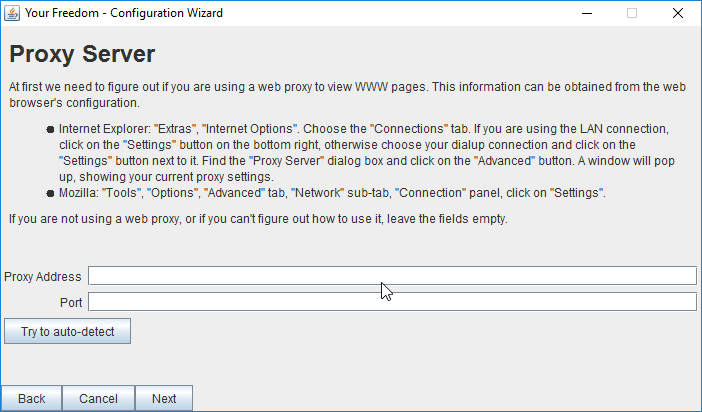 Select the Manual proxy configuration radio button, and enter in HTTP proxy as 127.0.0.1 and Port as 9666. Check mark the option Use this proxy server for all protocols. Click Ok.
Now to check if Firefox is correctly communicating with Ultrasurf software, put in the URL www.whatismyip.com in Firefox address bar. 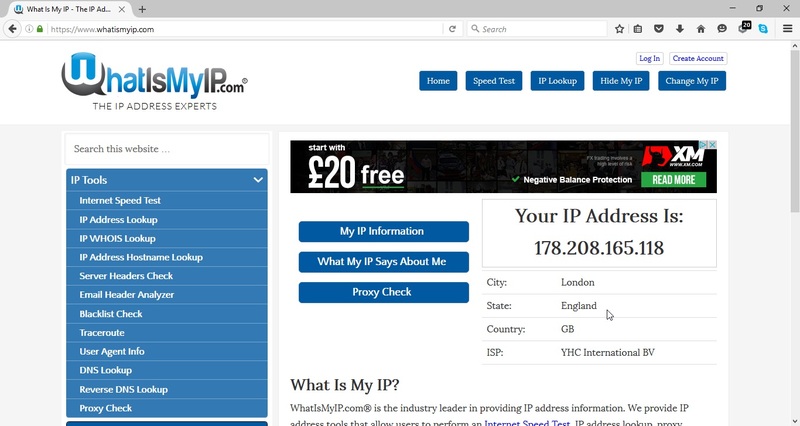 If WhatismyIP website doesn't shows your real IP then it means everything is working fine. This way Ultrasurf would not let the internet websites know your true location. As seen in figure 10, my location is being shown as United States whereas I'm actually visiting that website from Pakistan. 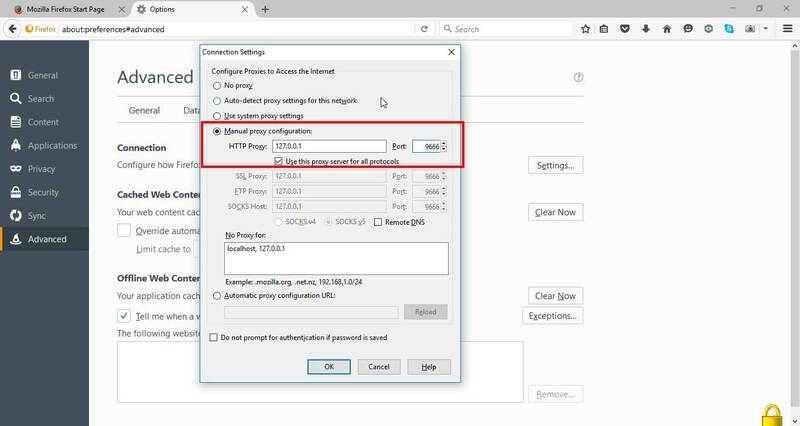 There is no need of doing any settings in Chrome because Chrome uses Internet Explorer proxy settings which Ultrasurf automatically sets. To exit Ultrasurf, bring up the Ultrasurf window and click the Exit button. Ultrasurf will give you a warning (see Figure 12) that you are leaving ultra secure domain. Also you are given two options to Close IE and Exit and Keep IE and Exit. You can choose either one. If you were using Firefox web browser to browse web securely through Ultrasurf then you need to remove the local proxy and port that we set in the Firefox settings. Simply repeat steps 1 to 3 of above "Settings for Firefox" section and select No Proxy this time. 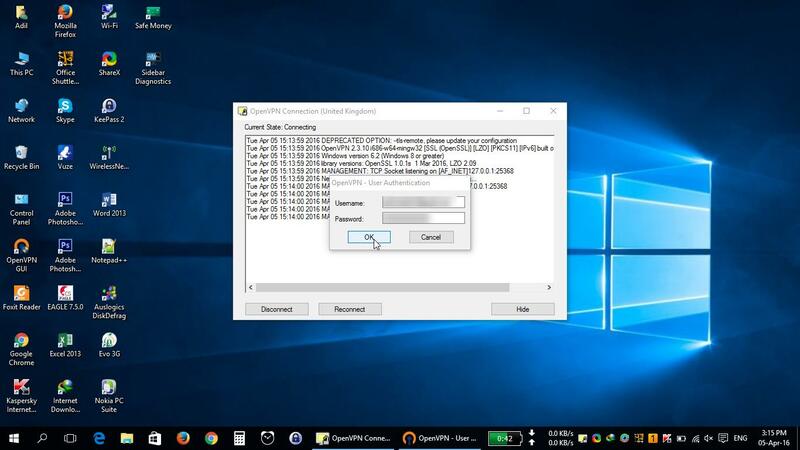 In this article we looked at unblocking Facebook, Twitter, Youtube using Ultrasurf. 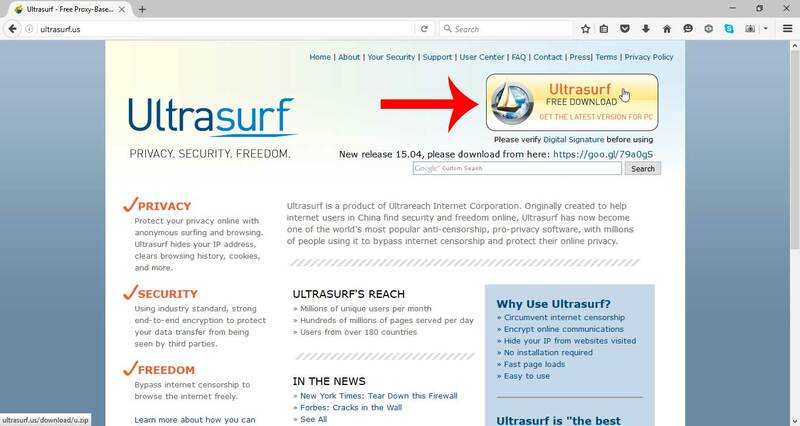 We downloaded Ultrasurf software through its official website, extracted the downloaded zip file and launched Ultrasurf. Additionally, we set Firefox to use Ultrasurf. No settings were made in Google Chrome web browser because Chrome uses system's proxy settings which Ultrasurf automatically sets. If there was any problem following the tutorial feel free to post in the comments box below. I'm always here to help. Liked this post? You may want to like our Facebook page or follow us on Google+ to get notified of new tutorials as soon as they are posted. 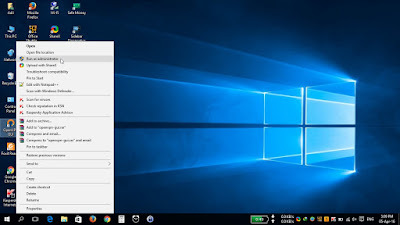 In the previous post I showed you how to install OpenVPN GUI on Windows 10. 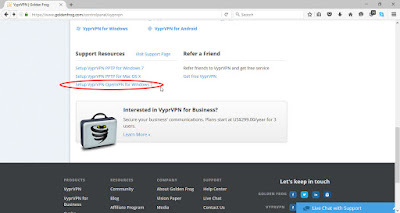 This post is about obtaining configuration files from VPN service provider and then connecting to VPN service provider using OpenVPN GUI application. People might use a VPN for various reasons but major use is for unblocking websites such as Facebook, Youtube, Twitter and for bypassing geographical restrictions imposed by websites. For example, Netflix, an online video streaming company headquartered in United States, offers some content that is only accessible in United States. Those living in US when traveling abroad or those who reside outside US might use a VPN to access their favorite shows. Netflix, however, has recently started blocking users who use VPN service to access content which is only available in US. Some VPN service providers, particularly those having a greater market share and operating for a long time, don't even offer a free trial. Some do offer a free trail of 3-days or 7-days after which you are billed according to the package selected at the time of registration. You also have to provide your credit card information at the time of registration. In case you are not satisfied with the services of VPN service provider, you can cancel your subscription anytime during trial period. Some VPN service providers, particularly those who are new in market, provide free accounts with limited data and limited selection of servers. 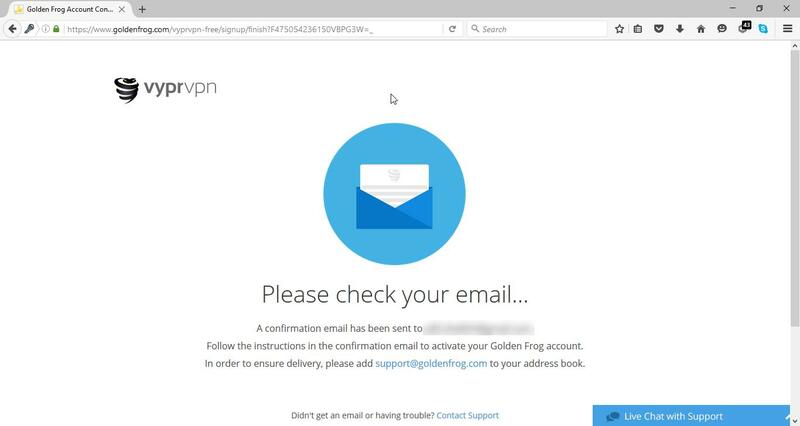 VyprVPN is a product of Golden Frog, GmbH incorporated in Switzerland. 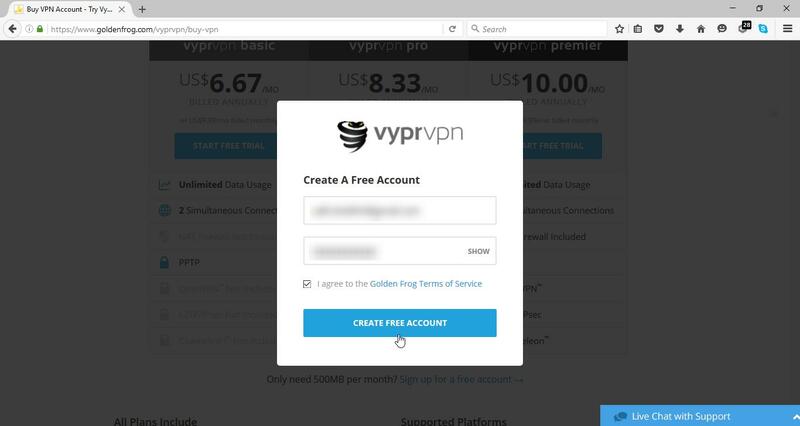 With VyprVPN you can get a free account without providing any credit card information. The free account gives you 500 MB of data per month free one time 500 MB of data and allows access to all of its servers. You might think that this data limit is too low. Yes, it is but we should also appreciate that we are getting it free. Most VPN providers don't even offer that. You can always buy a paid package plan should you need more data. This means that this step-by-step guide will not work if you register a free account. 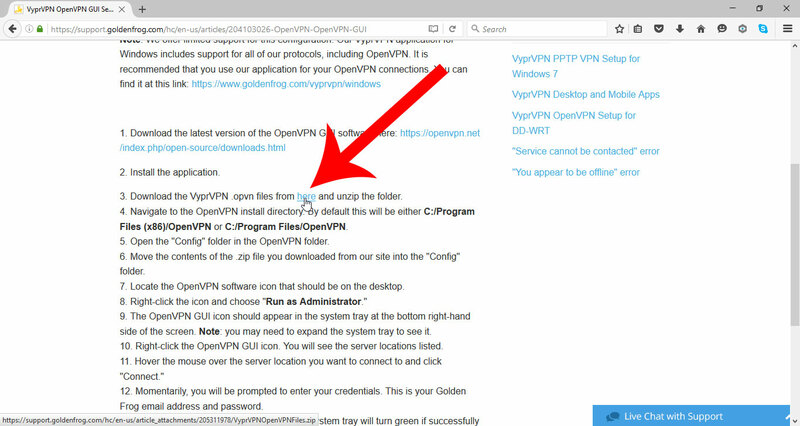 The guide presumes that you have OpenVPN GUI installed on your PC. 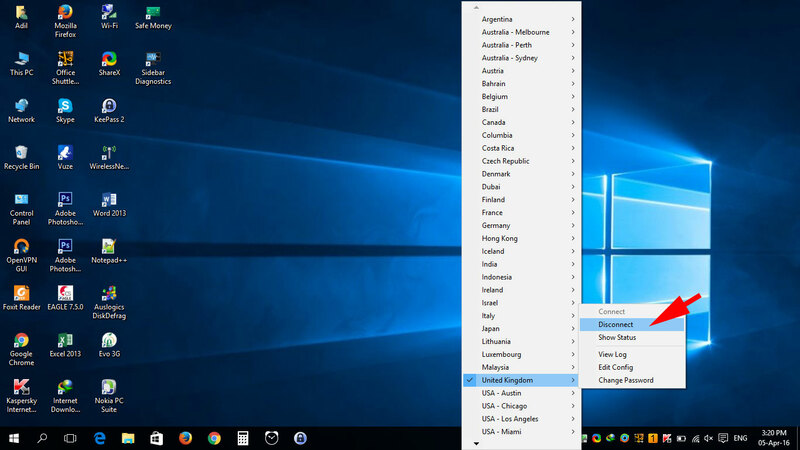 If you haven't yet installed OpenVPN GUI see this guide that describes the process of installing OpenVPN GUI on Windows 10. 3) A box will appear, enter your email address and password. Then click on Create Free Account. Make sure you provide a valid email address because you will be sent a confirmation email at this email address. After clicking on Create Free Account a new page will appear indicating that we need to check our email (see Figure 4). In the confirmation email there will be a link. Click on that link to get your email confirmed. 4) After clicking on the confirmation link in the email, the following page will appear. Click on Control Panel in the upper right corner of the webpage. 5) Once in the control panel click on the VyperVPN tab in the extreme left. 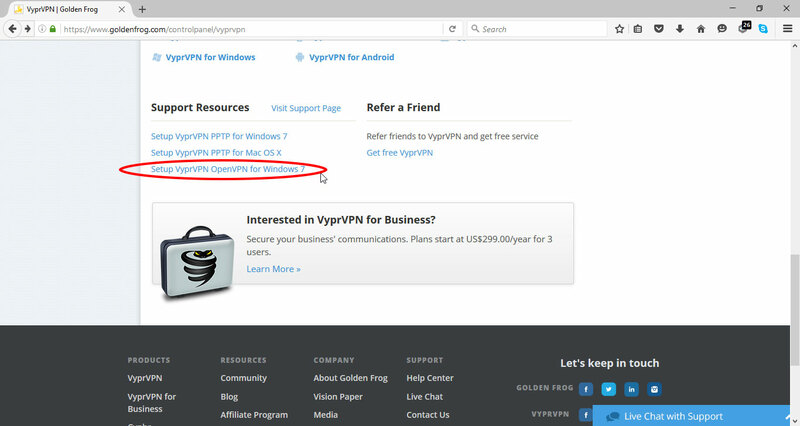 7) A webpage with title VyprVPN OpenVPN GUI Setup for Windows 7 will appear. 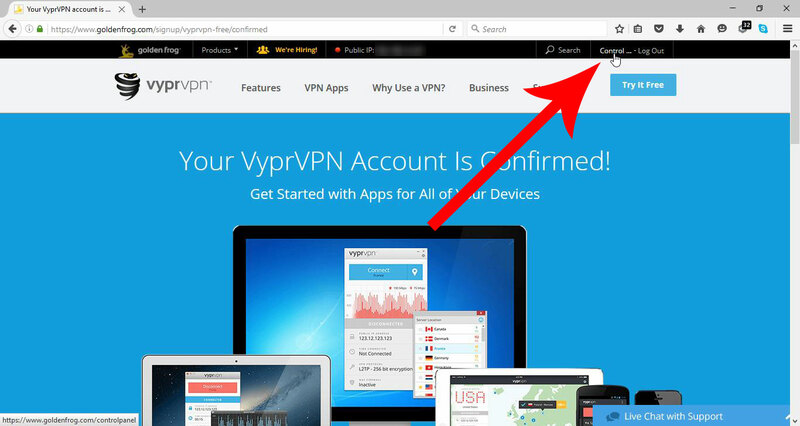 Scroll down and click on here to download VyprVPN .ovpn files. 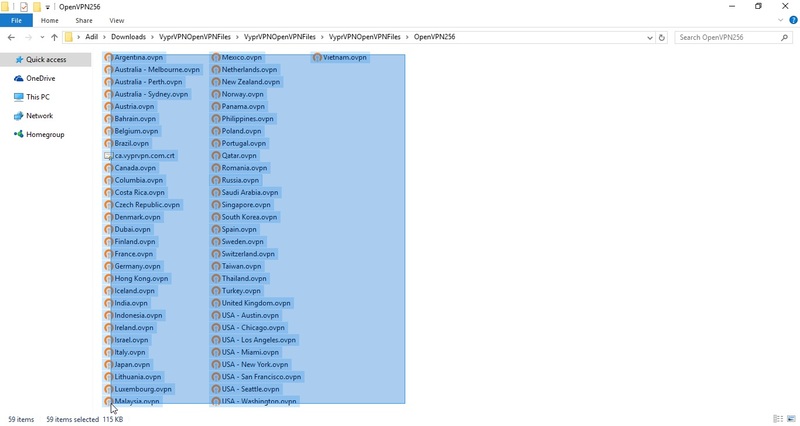 These are the files that need to be copied in OpenVPN config directory. 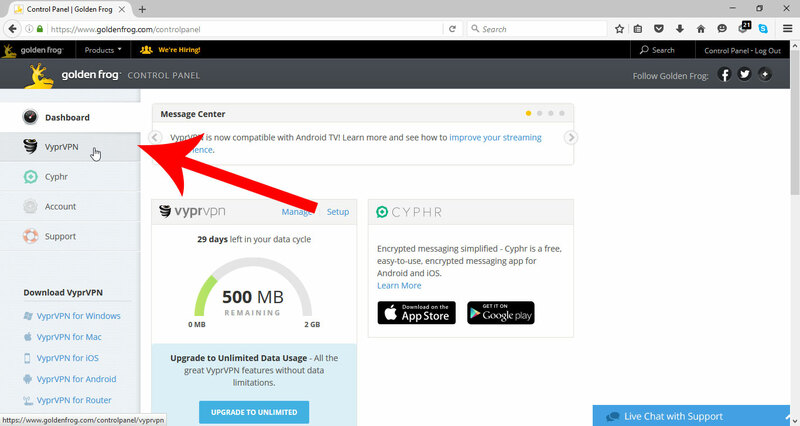 8) A zip file containing VyprVPN .ovpn files will be downloaded. Your web browser will put the downloaded zip file in the Downloads folder. 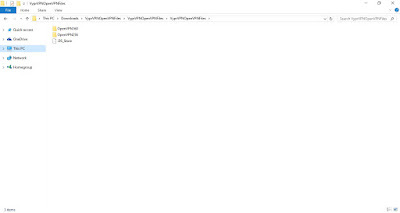 Go to the downloads folder, right click on the downloaded zip file and click on Extract to VyprVPNOpenVPNFiles. 9) A new folder with the name same as of zip archive will appear in the Downloads folder. Go in the folder and you will find two more folders with the names OpenVPN160 and OpenVPN256. The numbers 160 and 256 refer to 160-bit encryption and 256-bit encryption respectively. Obviously 256-bit encryption would be more secure. Next, we see a small dialog box (see Figure 14) stating that OpenVPN GUI does not supports more than 50 configs. This is just a limitation of OpenVPN GUI. 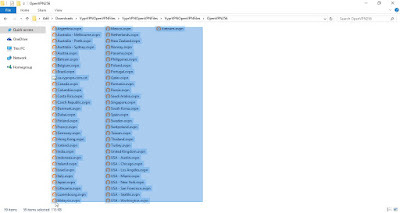 A quick solution is to go back to config folder and delete some .ovpn files so that there are fewer than 50 .ovpn files in the config folder. 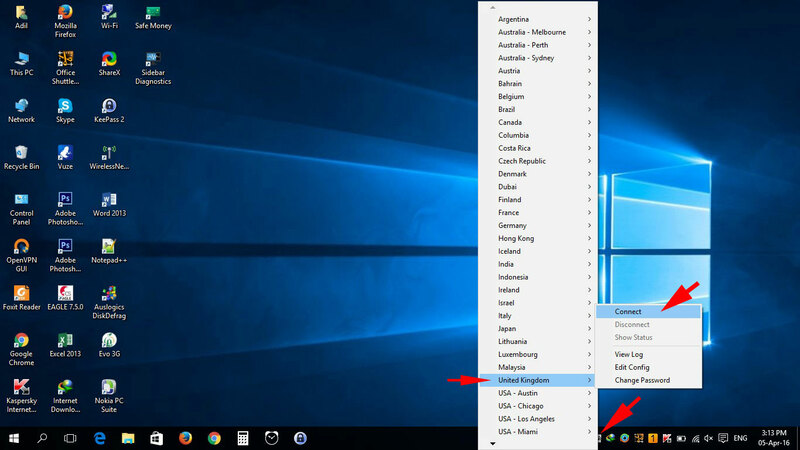 12) Right click on the OpenVPN GUI icon in the system tray – the portion of the taskbar near the clock. 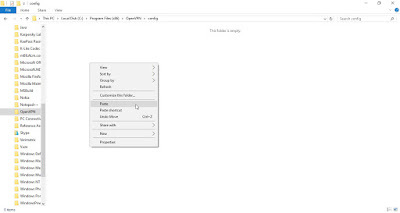 A context menu showing a list of servers will appear. 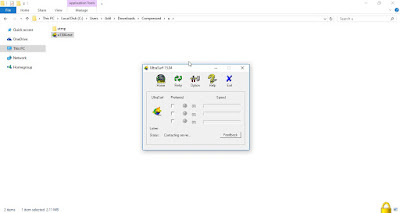 Hover the mouse over any server and select Connect in the sub menu that appears. 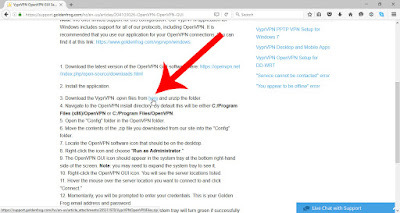 13) OpenVPN GUI is asking for the username and password to connect to the VyprVPN server. The username is the email address that we entered during registration. The password is also the same password that we entered during registration. Wait a few moments while OpenVPN GUI creates a secure connection between your computer and the VyprVPN server. After a successful connection with the VyprVPN server, the OpenVPN GUI icon in the system tray will turn green. 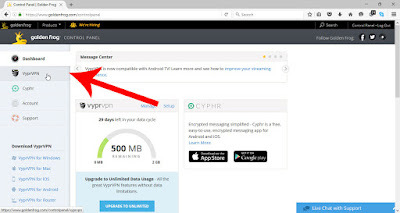 To verify if you are indeed connected to the VyprVPN server go to www.whatismyip.com and check the IP address. This website also displays the location with the IP address. 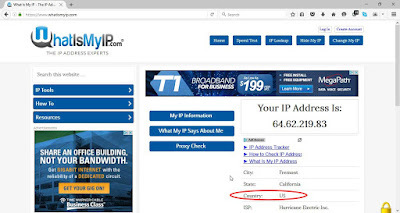 In Figure 17 you can see that the WhatismyIP website is showing my location as England when actually I'm visiting that website from Pakistan. 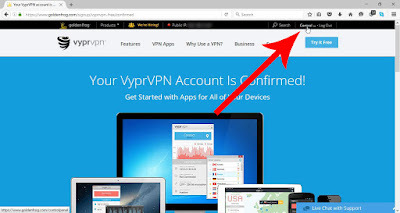 14) When you would like to disconnect your connection to the VyprVPN server repeat step 12 but this time click on Disconnect instead of Connect. 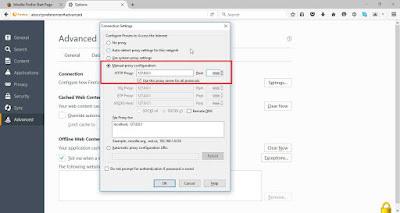 In this article we looked at the process of connecting to a VPN server using OpenVPN GUI. 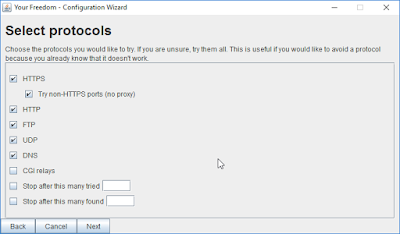 OpenVPN GUI needs .ovpn config files to be able to connect to a VPN server. 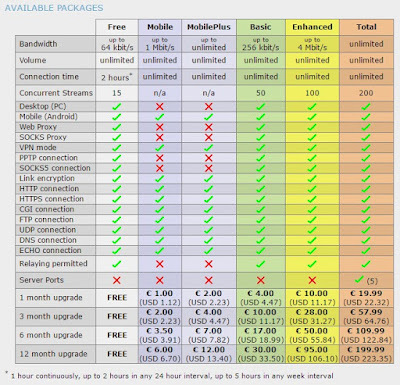 Nearly all the VPN service providers support OpenVPN protocol and provide .ovpn config files. As an example we registered a free account at VyprVPN, obtained .ovpn config files and connected to a VyprVPN server using OpenVPN GUI. 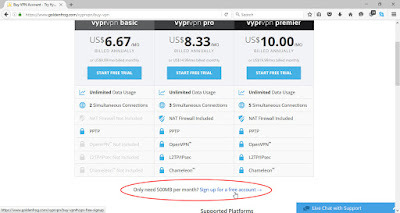 It is very rare for VPN service providers to give you a free account but VyprVPN does. Their website is beautifully designed, have a good customer support, have an app for every platform Windows, Android, Mac, iOS, have servers at 50+ worldwide locations and have their very own Chameleon protocol. You may also want to read my other tutorial on unblocking youtube using SoftEther VPN. I hope this tutorial was easy to understand and follow. If you got stuck somewhere and want help or just want to give your feedback on this tutorial, don't hesitate to leave a comment in the comments box below. How OOP is different from Procedural Programming? Copyright © 2013 - 2016 WebnComp.com All rights reserved.. Powered by Blogger.